Corbett High School juniors and seniors were riveted and clearly moved by a scene playing out before them Wednesday afternoon simulating a car accident that killed one of their classmates, badly injured two community members and sent the intoxicated student driver to prison for 10 years. The fatal "scared straight"-type faux accident happened just two days before the Corbett Cardinals play their homecoming game Friday, Sept. 28, and was a reminder to the students of the possible consequences of driving impaired: drunk, high or distracted by texting or cellphones. 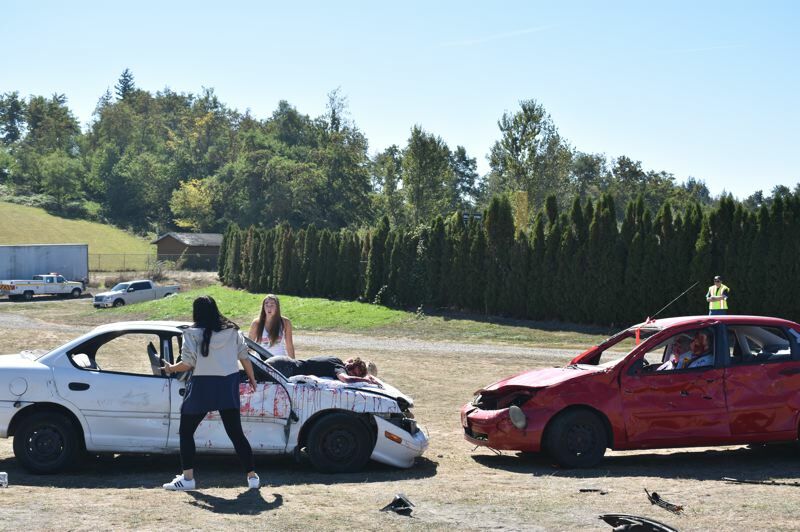 Actual students from Corbett High portrayed the kids involved in the accident that occurred because the driver was drunk. Two community members played victims of the accident. All wore convincing-looking make up. 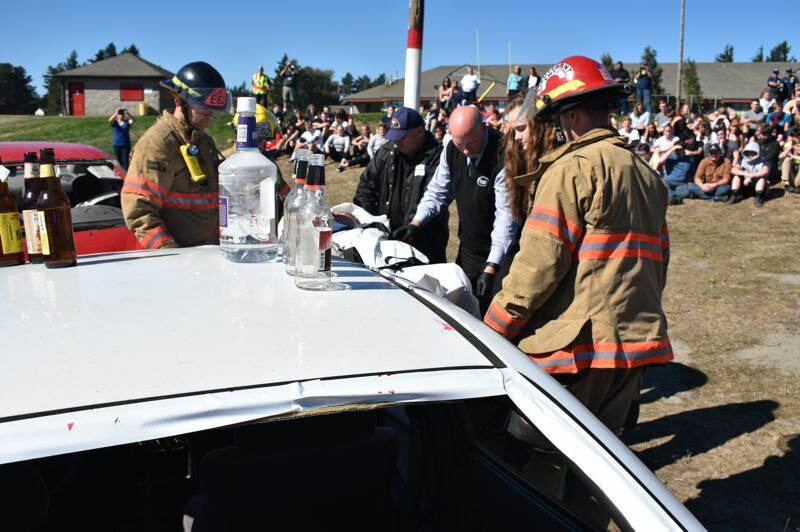 As the Corbett student audience settled into a field behind the high school, two cars were covered by tarps and a loudspeaker played a recording of the drunken chatter of the students deciding to drive from one party to another. The recording then played horrific sounds of the crash and the four students screaming. 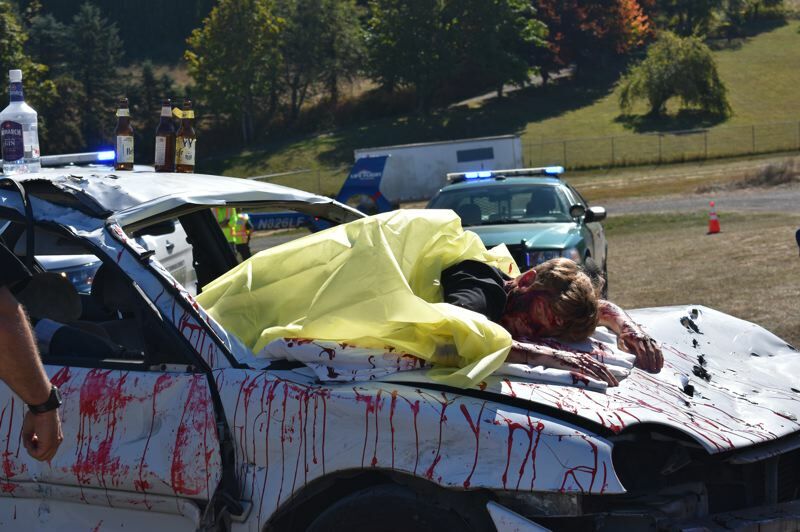 In the simulation, Corbett student Jordan Fahlman, 17, portrayed himself not wearing his seatbelt, being thrown through the windshield and killed. The students in the audience were quiet and clearly affected by the scene unfolding before them. 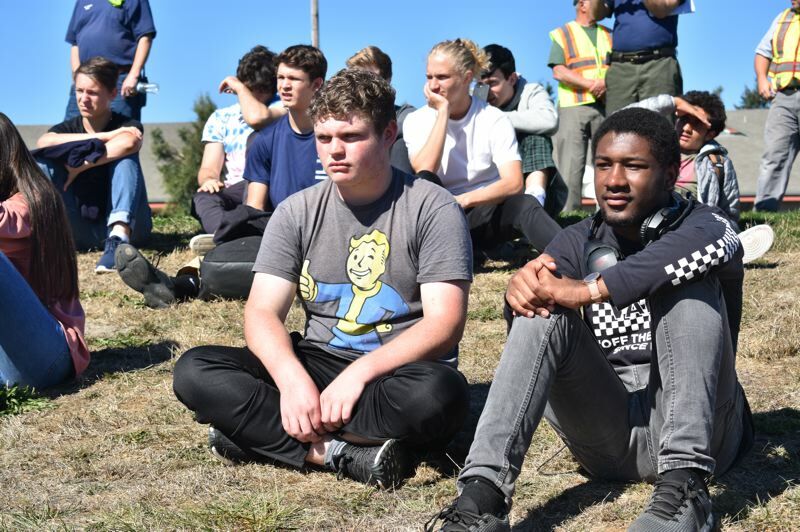 Corbett High Principal Phil Pearson said using their actual classmates as the students driving, injured and dead added to the demonstration's emotional gravity "especially in a small school," he said. "Everybody knows everybody." Police, fire and ambulances quickly arrived on the scene and one fireman screamed and fell to his knees when he realized the "dead" child was his son. Although the firefighter was just acting, he was not told the student cast as the deceased child was actually his son, which added poignancy for the students in the rural village. "I thought it was an amazing replica of what actually happens in an accident," said junior Elan Jackson. "It really moved me." Dozens of first responders from multiple agencies and others participated in the elaborately staged accident. American Medical Response, Life Flight, Multnomah County Sheriff's Office, Multnomah County Sheriff's Office Citizen Patrol, Washington County Sheriff's Office, nonprofit SKID (Stop Kids Impaired Driving) Wunsch Towing, Bateman Carroll Funeral Home, Bill's Town Car, Bridge City Music lent assistance, vehicles and equipment. This is the second time in three years Corbett has participated in the exercise. "If it prevents one situation, it's worth it," said one volunteer firefighter. As first responders were tending to the victims, Payton, who played the drunk driver, is given a field sobriety test, read her rights and hauled off to a police car. The crowd later learns she is serving 10 years in prison. 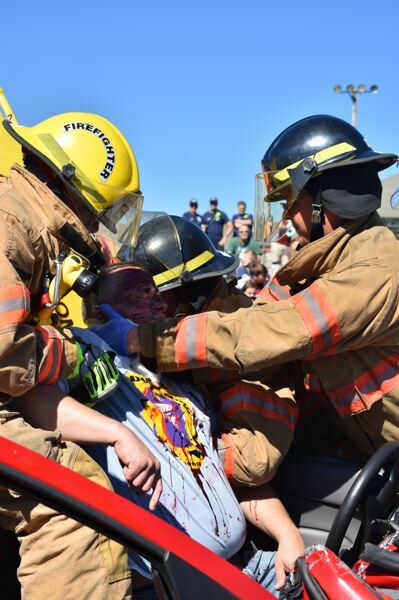 Firemen use the Jaws of Life tool to extract the two community members from their wrecked car. One is put in an ambulance and the other is put in a Life Flight helicopter headed for a trauma center. The students fell completely silent when their classmate Jordan Fahlman's "body" was reverently covered by a tarp. The "medical examiner" showed up with a black hearse, and Fahlman's body was zipped into a body bag and slid into the hearse. Some students looked anguished as the medical examiner showed a toe tag and asked the students how they would feel if "I'm standing face-to-face with your parents and have to tell them" you are dead. That moment was too much for junior Shanaya Nelson. Sobbing, she said "visualizing what my parents would go through ..." her voice trailed off as her classmates surrounded and comforted her.